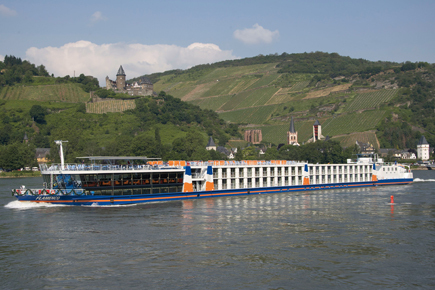 The MS Flamenco is modern and elegant and belongs to the ship type "Twin Cruiser" (passenger and machine area is separate) and is therefore particularly quiet. The atmosphere on board is cozy and informal - just to feel good. The comfortable outside cabins on the middle and upper decks, with floor-to-ceiling panoramic windows that open onto a French balcony, offer a magnificent view of the passing landscape. The restaurant is located on the middle deck and offers culinary delights for every palate, whether for breakfast, lunch or dinner. There is also a separate staircase to the lounge / bar on the upper deck with comfortable seating, dance floor and a diverse selection of drinks. Through the front glazing over two decks you have in the restaurant and in the lounge / bar a wonderful panoramic view.On the top deck is a sun bathing area with plenty of seating and reclining furniture and awning. Relaxation can be found on the main deck in the sauna and relaxation area with relaxation chairs. In addition, fitness equipment is available for sports enthusiasts. The comfortable cabins are stylishly furnished and are about 12 square meters, all outside. The cabins on the main and middle decks have two lower berths, one of which serves as a cozy sofa during the day and the other is folded to the wall. 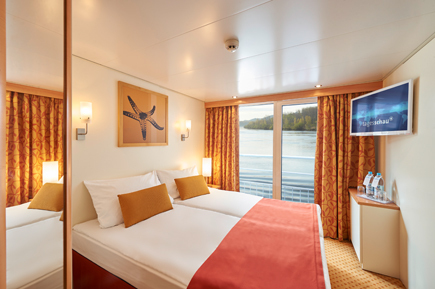 On the upper deck, the cabins are equipped with double beds (adjustable as twin beds).In addition, the cabins on the middle and upper deck have floor-to-ceiling panoramic windows that open onto a French balcony. For safety reasons, the portholes on the main deck cannot be opened. Here, the cabins can also be occupied by three people (Pullman-upper bed). All cabins of the MS Flamenco are equipped with shower and toilet, TV, radio, air conditioning (individually regulated), telephone, safe and hairdryer.